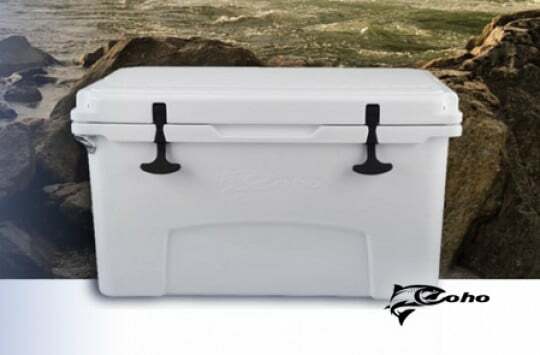 Lifetime Cooler Review: Perfect For Your Camping and Fishing Trips! We’re finally doing a Lifetime Cooler review! I love the pun in the name! Think about it; we’ve been doing different cooler reviews for different cooler brands. That’s what you’re used to from us. So one day you’re checking to see our latest post, and you see this rather bold title screaming “Lifetime Cooler Review”! It seems to imply that it’s going to deliver the only cooler review you’ll need to see for the rest of your life; a lifetime ice chest review. Well, that’s not what this is going to be, dear beloved reader. Lifetime is a brand, and they make coolers. Actually, this brand is known for making a lot of different products, ranging from tables and chairs to sports gear. Banking on their success in other fields, they have decided to venture into the cooler market. At the moment, they only offer two sizes and one color of the cooler, which means almost zero options in terms of variety. However, since it’s their first cooler, we’ll forgive them and focus on reviewing what they have to offer. We hope you enjoy the review as much as we enjoyed writing it (we certainly enjoyed writing that intro)! 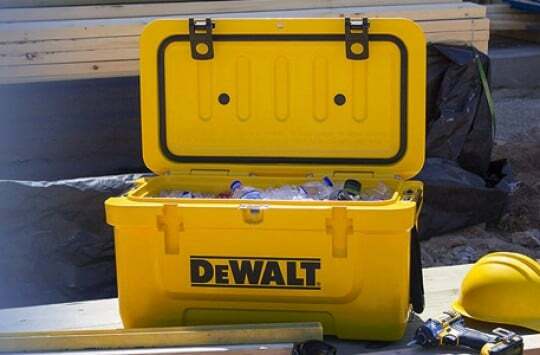 We’re partial to this particular ice chest for the color scheme, if for nothing else. Sure, you don’t get much in terms of color variety, but whatever’s already there is so good you might feel like you don’t need any other options. The gray and blue are so perfect together that the cooler feels ‘cool’ right off the bat. The cooler is rotomolded, which is something we’re always happy to know about a cooler. Show us a great looking supposedly great performing cooler, and we’ll immediately ask if it’s rotomolded. If it’s not, we’re going to approach its advertised insulation capabilities, ice retention, and durability with a healthy amount of skepticism. Tell us its a rotomolded ice chest, and we just might take everything you tell us about it from there as gospel truth. Okay, maybe we won’t take it as gospel truth, but we will be very very happy with the cooler. The fact that this cooler is rotomolded means that it’s very strong and durable. 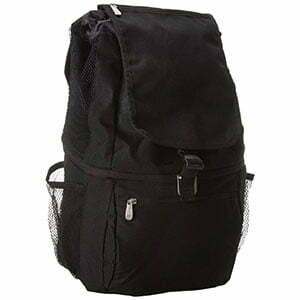 You can see from its rugged look that it was designed to go through the harshest of conditions without a problem. However, this cooler isn’t just about looks. The fact that it has a one-mold construction means that it will actually survive all those drop tests and bear attacks. Speaking of bear attacks, this cooler happens to be certified bear resistant (by IGBC). The overall shape and design is not quite Yeti-like, which is always a plus for us geeks that have grown jaded by a world of brands making coolers that look too much like Yeti Tundra coolers. It has the basics down, but it tries to be different in its own way. That said, it still does bear a resemblance to certain other cooler brands, such as Kong and RTIC. Let’s start with the lid, which is well-built and features a commercial grade rubber gasket on the inside. That makes for very good insulation and helps to keep the heat out and the cold in. The lid comes with some very strong rubber latches attached for easy and tight shutting. 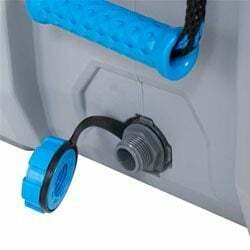 The rubber latches are very easy to operate, with an easy mechanism for securing them. They operate a lot like the T-Rex on Yeti and other popular coolers. However, they don’t quite look like T-Rex latches. The design is different, which means Lifetime get an extra point for trying to differentiate themselves from the competition. The hinges at the back of the lid are also pretty strong and guaranteed to hold fast against almost any kind of pressure, including the damage that could potentially be done by a bear. The lid also comes with a hole in the middle for securing using a padlock. Tie the rubber latches on securely, add in the padlock, and what you have is a highly secure cooler that cannot be infiltrated by the strongest bear in the wild. That’s something hikers, and campers are going to be happy to hear! On the side, there are the handles, made of nylon rope and a rubber handle. The color contrast with the gray of the cooler is beautiful. What’s even more beautiful is the strength and convenience of these size handle. The two available sizes are the 55-quart and 77-quart coolers, which are definitely not going to be light when fully loaded by anyone’s measure. Being able to haul them around is an important thing to consider. The nylon handles are pretty strong and ensure carrying this cooler is a lot easier than it would otherwise have been. That said, given the sizes of the coolers, we think it would have made more sense to put wheels on them for easier hauling. On the bottom, we have anti-skid feet. 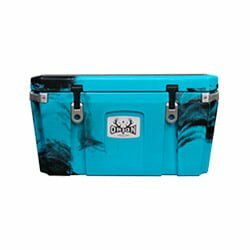 A cooler this large needs to be perfectly stable, especially when you’re hauling it in the back of your pickup truck on a long distance trip. You don’t want it sliding around and shaking the contents. The anti-skid feet make sure that never happens. The cooler also comes with a nifty screw-on drain plug that’s easy to drain when you want to get rid of all that leftover water from the melted ice, making it easy to clean the cooler quickly and efficiently. The plug has a rubber leash, which means you won’t have to worry about losing it once you’ve opened it. There’s also a stainless steel bottle opener attached to the lid, which is a convenience for those times when you need to open your beer but forgot the bottle opener at home. Something we didn’t like about this cooler is that it doesn’t have a dry goods basket for those things you generally wouldn’t want coming into contact with the ice. We hope they include that in future models. The advertised ice retention on the Lifetime website is 7 days. However, we noticed a lot of reviews on YouTube by actual customers putting it at a much lower figure of between 3 and 4 days. We decided to check for ourselves and tested the ice retention on the cooler. We kept the opening of the lid to a minimum and kept the cooler out in the sun. The first signs of melting came after 4 days. We reckon it could last 5+ days without being directly exposed to the sun like that. While that isn’t the same as the advertised 7 days, it’s certainly good enough for most people’s purposes. 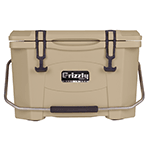 This cooler comes in two available sizes: the 55 quart and the 77 quart. 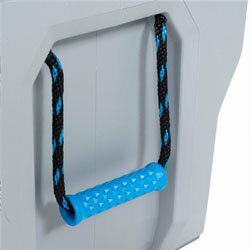 It offers just one color: gray with blue highlights on the latches and handles. 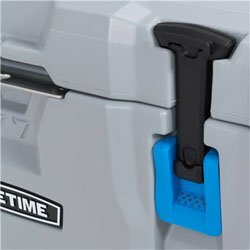 Lifetime offers a limited warranty of 5 years on their cooler. You would, however, have to register your cooler on their website after you bought it to be eligible for the warranty. What we loved the most was that you get lifetime customer service when you buy and register one of their coolers. The customer service at Lifetime is pretty good! This is an all-purpose cooler; the kind you can take just about anywhere for just about any purpose. Given the affordable price, it’s a steal! Lifetime is the new kid on the block; the underdog; the newcomer. 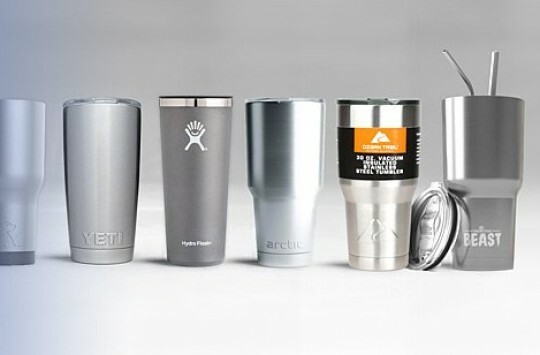 Yeti, on the other hand, is the veteran; the industry leader; the reigning champion. This matchup seems quite unequal for Lifetime. However, this little underdog has quite a bit to offer when compared to the giant Yeti. For starters, Lifetime has a beautifully unique design. Sure, Yeti has a great design too, but it is often the case that newcomers simply try to rip off Yeti and make money off of it. In this case, Lifetime actually put some work into looking different. When it comes to variety, Yeti is the clear winner, having a lot more sizes, colors, and customization options to offer than Yeti. 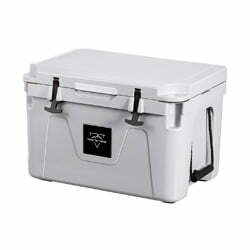 However, if you don’t need a cooler smaller than 55 quarts or larger than 77 quarts, Lifetime should be perfect for you. Their color scheme is also good enough that most people won’t feel the pinch of the lack of variety. 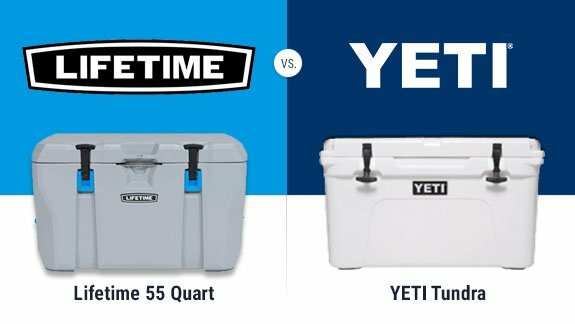 Yeti beats Lifetime again when it comes to ice retention, with their cooler being able to keep ice for longer. However, Lifetime’s 5-day ice retention is still good enough for most needs. When it comes to price and value offered for that price, Lifetime wins, giving many of the qualities of a premium cooler without charging a premium price. If you’re a die-hard fan of Yeti and can afford the price tag, then it’s a good idea to stick to the industry leader. However, if your pockets aren’t so deep, and you’re willing to try something new, then Lifetime is one of the best purchases you can make when it comes to value for your money. 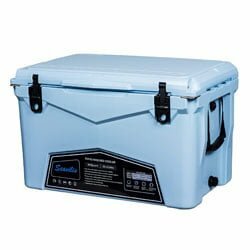 The Igloo Sportsman line of coolers does feature a 55-quart cooler, among other sizes. 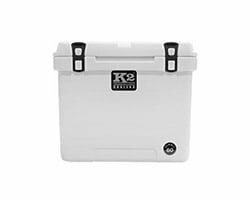 This brand is well-known for making tough coolers since 2013 at an affordable price. We definitely enjoyed covering it. 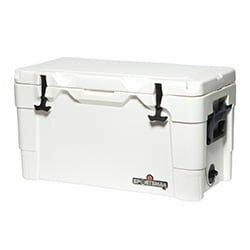 The Pure Outdoor cooler, as we noted when we reviewed it, was built for those who want something with just the right mix of tough and soft to make having a good time easier. This brand is also known for their excellent customer service, just like Lifetime. We covered Milee Coolers, which was later renamed to Seavilis Coolers. This cooler definitely has a funky and fun-loving vibe to it. It’s also got some great features that come at an affordable price, just like Lifetime Coolers. Lifetime Coolers For Sale – Where to Buy Them? Lifetime coolers can be bought on the Lifetime website as well as lots of online marketplaces. However, we recommend that you make your purchase on Amazon, which happens to be the most trusted online marketplace internationally. With Amazon, you get buyer protection as well as access to reviews by other customers, allowing you to make more informed purchase decisions. In certain cases, you could also get free shipping, one-day shipping, or both. Our Lifetime Cooler review ends here, but that doesn’t mean it’s meant to last a lifetime. We’ll be back to review the next cooler brand that comes around. For now, we think this one’s pretty good. It looks good, feels right and keeps ice for long enough for most needs. For this price, it’s a very attractive proposition.